AUSTIN, TX — Following two uninspiring performances to open the season, Texas decided to turn it on. And did they ever. 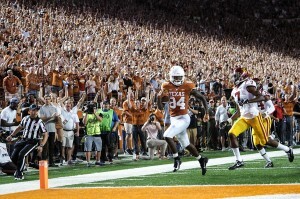 UT dominated in all three phases of the game as the Longhorns knocked off No. 22 Southern California 37-14 in front of a record 103, 507 fans on an electrically charged Saturday night at DKR-Texas Memorial Stadium. And Texas coach Tom Herman was all smiles. When USC put up 14 points in the opening stanza, it would’ve been easy for doubt to creep into the minds of the players and staff. But this isn’t the last few years’ Mack Brown team, or Charlie Strong, or even the 2017 version. 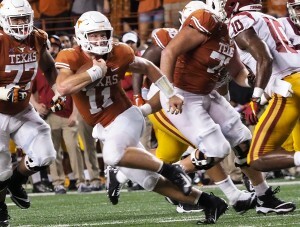 Behind the arm and legs of Sam Ehlinger – 15 of 33, 223 yards, two TDs and one rushing score – the Horns rattled off 34 consecutive points. Collin Johnson and Lil’Jordan Humphrey combined for 163 yards on 10 catches with one TD, while Tre Watson and Daniel Young added 129 yards on 30 carries on the ground. For Ehlinger, he’s played 12 quarters of football in 2018, with only the 4th period of Maryland viewed negatively. “I think it’s part of the development of the position, still learning and getting more experience every week,” Ehlinger said. But you can’t forget the defense, even though they had a first quarter to forget, giving up 14 points to the Trojan offense. Then Gary Johnson happened. And Caden Sterns. And Kris Boyd. Boyd noticed some changes during last year that made him more prepared for this final campaign on the 40 Acres. Johnson played like a mad man. He tallied six tackles, four TFL, one sack, and one forced fumble. Sterns covers the secondary like a hawk. Apparently he blocks field goals like Dikembe Mutumbo, too. Brandon Jones, who is at the beginning of breakout tour, led the squad in tackles with nine and two TFL. Both were part of a defensive effort that allowed -5 rushing yards. And let’s not forget the freshman place kicker Cameron Dicker. He was 3 of 3, including two from 46 yards, and kept the Horns close in the first half. It didn’t take long for USC to get on the board. They opened with a nine-play, 75-yard drive that took under five minutes, and staked the Trojans to an early lead, 7-0. Texas answered with its own 12-play, 72-yard drive. Three first downs from Sam Ehlinger to Collin Johnson or Andrew Beck lead to a Cameron Dicker 20-yard field goal, and a 7-3 mark. USC came back when Daniels hit Velus Jones Jr. for a 35-yard seam. Then Vavae Malepeai punched it in from three yards out giving the Trojans the 14-3 advantage. Southern Cal owned the first quarter. Texas took the next three. The Longhorns used their first possession in the 2nd half in style. Ehlinger hit Humphrey on two big plays – 35-yarder and a 47-yarder – with the latter hitting paydirt. UT went 75 yards on six plays, and got within four, 14-10. After a Boyd interception, Texas went 22 yards in six plays before a Dicker 46-yard field goal and a 14-13 margin. The momentum continued after USC drove the field midway through the 2nd quarter, hitting Amon-Ra St. Brown for a 36-yarder inside the 10. But Brandon Jones’ TFL on Stephen Carr’s 4th down carry gave Texas the ball and stopped the Trojan march. With three seconds remaining in the first half Dicker came through again, this time from 46 yards, and gave UT the 16-14 lead heading into halftime. Texas didn’t let up to begin the third quarter either. After a roughing the passer/targeting call on USC LB Porter Gustin, Ehlinger went back to the skies hitting freshman Joshua Moore for the 27-yard pitch-and-catch score. After 20 consecutive points, UT’s lead increased to 23-14 at the 10:45 mark of the 3rd. Then the UT defense made a play. Freshman Caden Sterns blocked a Chase McGrath field goal attempt, then Anthony Wheeler picked up the loose change and went 46 yards to the house. 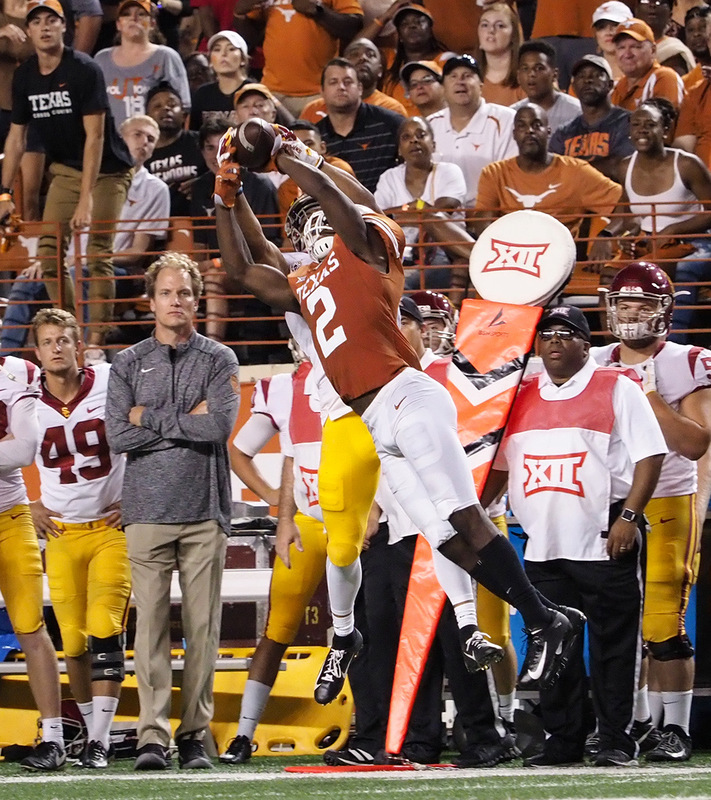 It marked 27 consecutive points by the Longhorns and a 30-14 lead midway through the third. Ehlinger added the final score on a 4-yard scamper with 1:42 left in the third. 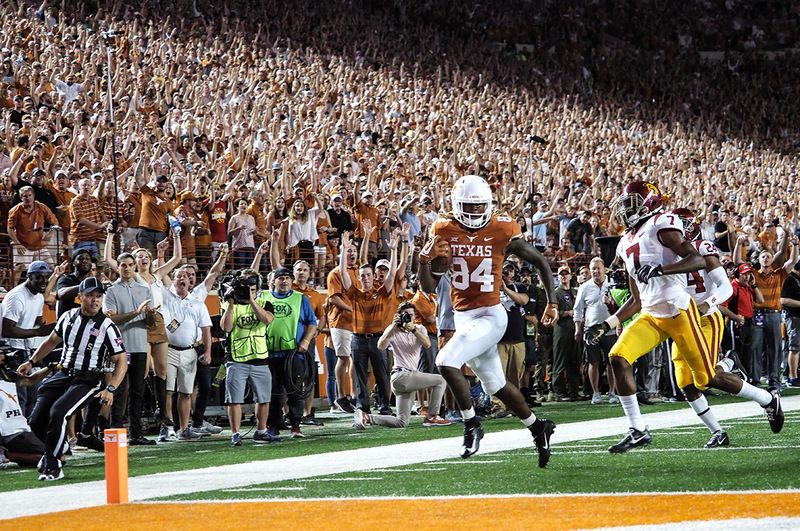 What was the first reaction after such a big win on a big stage in front of a big crowd at DKR tonight? With TCU coming into Austin next weekend and the start of Big 12 play, I asked Omenihu what needed to be done to use this momentum towards thwarting the Horned Frogs of Fort Worth. “Find what the good (film) was, multiply by 10, then subtract the bad and don’t make the same mistakes,” said Omenihu. Sounds like the beginning of a good game plan heading into next week. Tonight was a great start.